PORTLAND, Ore. - April 10, 2018 - PRLog -- From a variety of music styles, trivia, dance and personality Kato Kaelin introducing it all, Wizard World (OTCBB:WIZD) today announced the highlights of its non-stop entertainment lineup at Wizard World Comic Con Portland, Friday through Sunday at the Oregon Convention Center. The initiative, designed to keep the show floor buzzing throughout the weekend, will feature national and local acts of all kinds, allowing fans to enjoy more of the best of pop culture during the events. All of the entertainment is included free with any admission to the show, unless noted, and is separate from the previously announced programming panel schedule. The "Kids Zone" will also feature a variety of activities for the younger set, including face painting, coloring, dance parties and read-alongs, highlighted by the one and only Henry Winkler ("Happy Days"), author of the Hank Zipzer franchise of children's books, reading to kids on Sunday at 12:30 p.m. 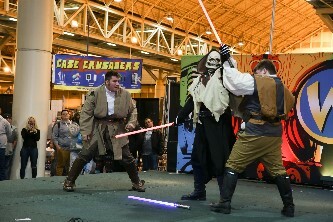 The Entertainment Stage, introduced in 2017 as an added feature to enhance the atmosphere at Wizard World events, has been a huge hit, with Kaelin serving as host, including trivia and giveaways right from the entertainment stage. The stage, located just inside the main entrance, is the hub for much of the rapidly-rotating schedule, with others spread around the show floor. The full schedule of entertainment and programming can be found at http://wizardworld.com/programming-entertainment/Portland. For more on the 2018 Wizard World Portland, visit https://wizardworld.com/comiccon/portland.